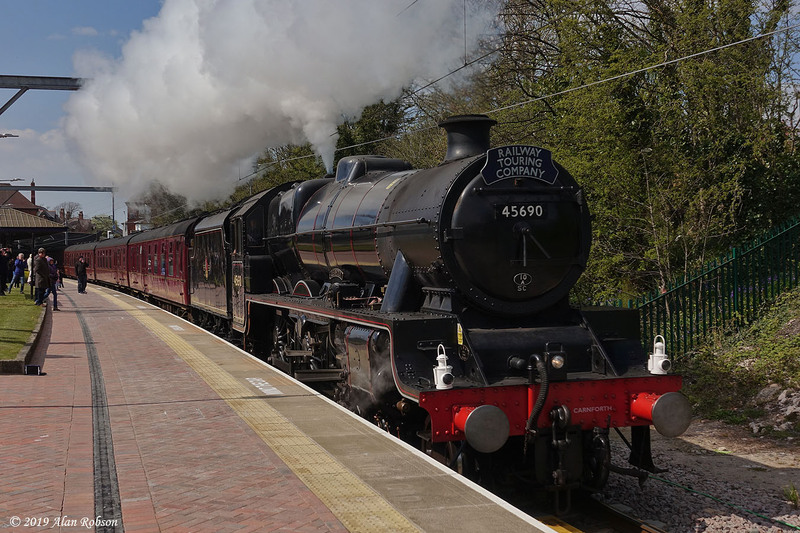 A steam special excursion train visited Blackpool on Saturday 13th April. 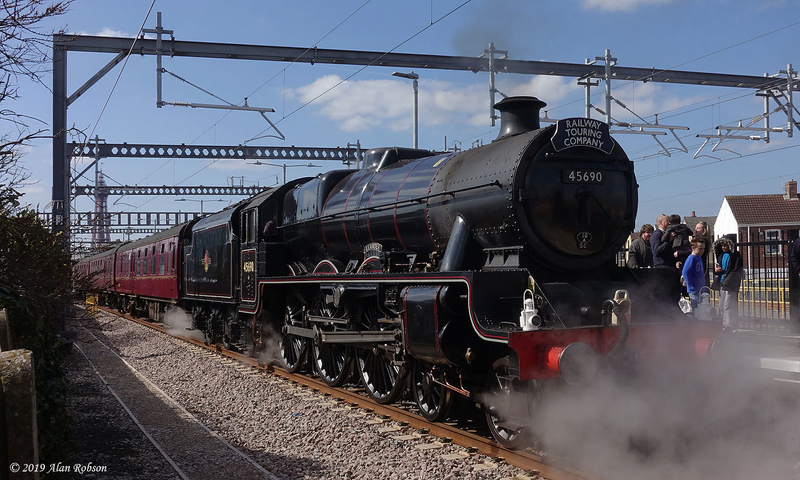 The "Pennine Blackpool Express" left London Euston at around 07:10, pulled by preserved Class 86 E3137 "Les Ross", heading north along the West Coast Main Line, picking up passengers at Milton Keynes, Rugby, Nuneaton, Crewe and Preston. 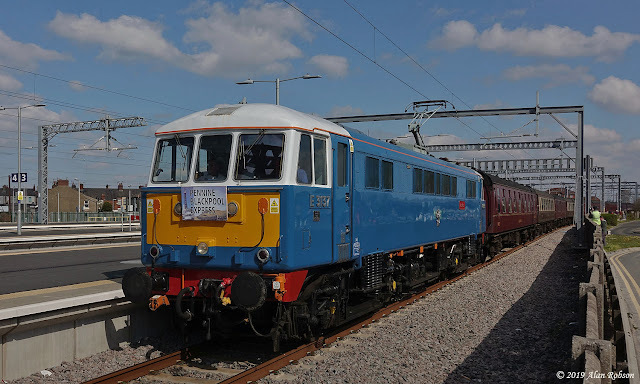 At Preston, Jubilee Class 45690 "Leander" was attached to the rear of the train and hauled by the Class 86 to Blackpool North, with a scheduled arrival of 11:18. Around three hours were spent in Blackpool, allowing the passengers time to visit the town and its attractions. At Blackpool North the Class 86 electric loco was detached so that it could re-position to Carnforth to await the return of the steam hauled special later in the day. 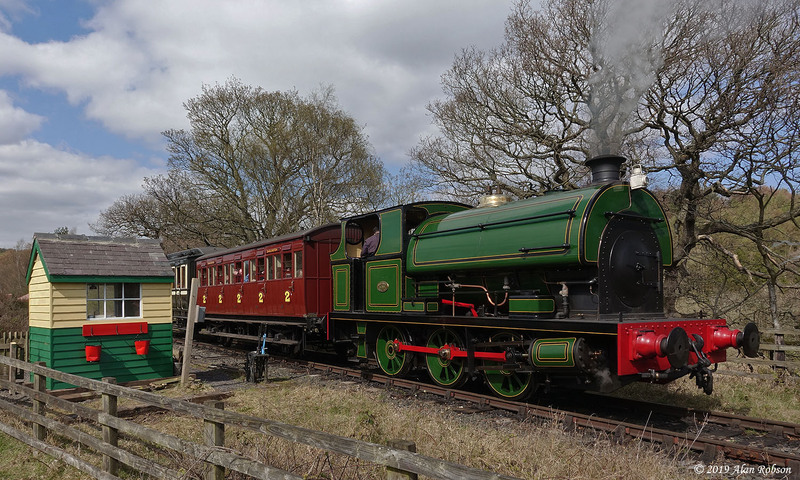 The steam leg of the journey was due to depart from Blackpool at 14:04, travelling via Bamber Bridge and Blackburn, joining the Hellifield line at Daisyfield Junction and tackling the steep climb up to Wilpshire Tunnel. A long descent then followed towards the 48-arch viaduct over the River Calder at Whalley. After Clitheroe the train continued to follow the Ribble Valley towards Hellifield, where there was a water stop scheduled. 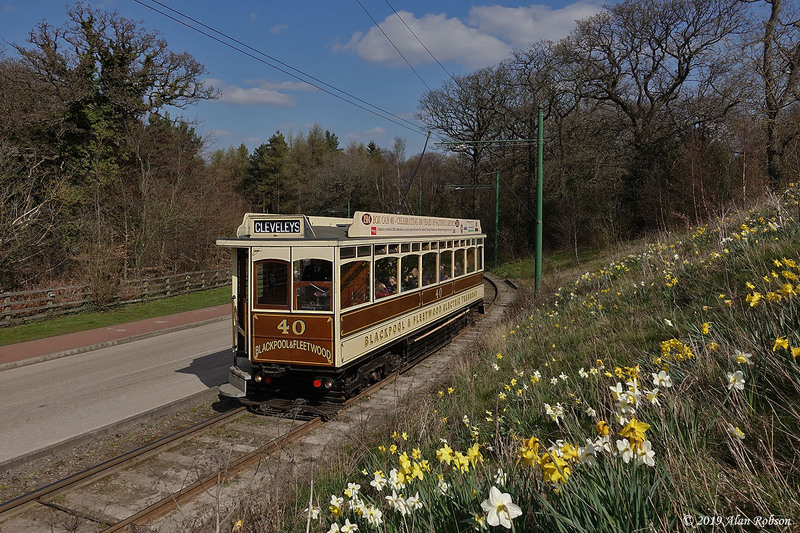 The last section of the journey to Carnforth included the steep climb at 1 in 100 from Settle Junction up Giggleswick Bank, following the Bentham Line via Wennington before finally reaching Carnforth. Here the steam loco "Leander" was uncoupled from the train which then returned via the WCML to London Euston behind the Class 86 electric loco, with a scheduled arrival of 22:27. 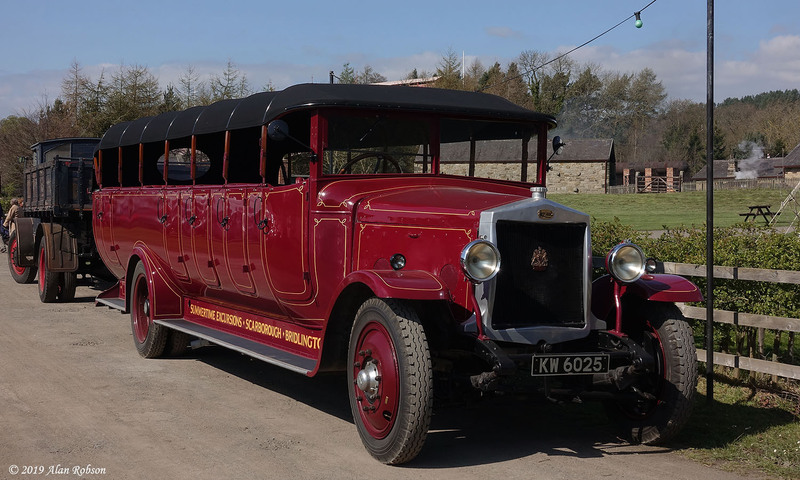 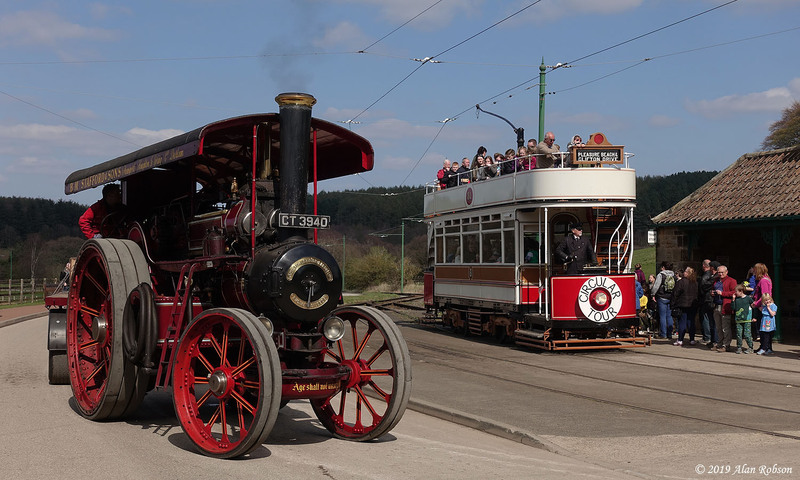 The annual Great North Steam Fair took place at Beamish again this year, running from Thursday 11th to Sunday 14th April. 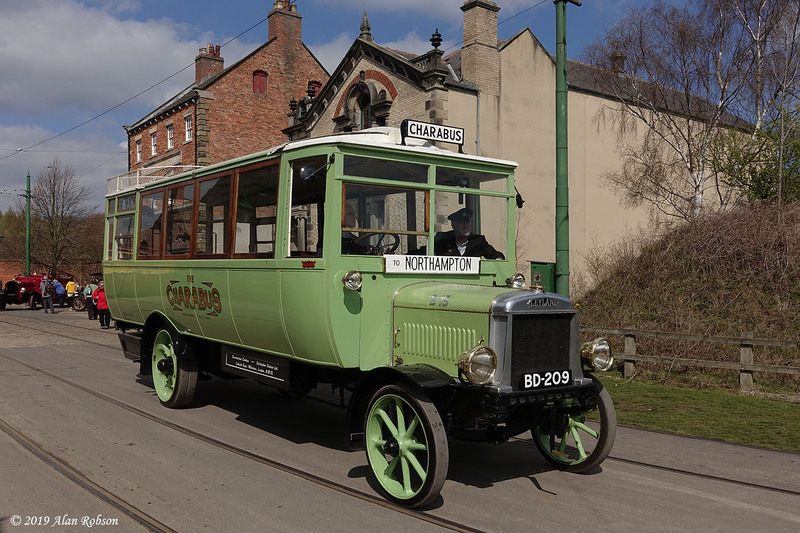 Visiting vehicles of interest were Blackpool & Fleetwood Box Car 40 from Crich, Manchester 765 from Heaton Park, 15 inch gauge steam locomotives River Irt and Katie from the Ravenglass and Eskdale Railway, plus the usual varied selection of rare and unusual vehicles from all around the country. The first day on Thursday saw completely blue skies all morning with plenty of sunshine on offer throughout the afternoon, which made a pleasant change as the weather in the North East can be very fickle at times. 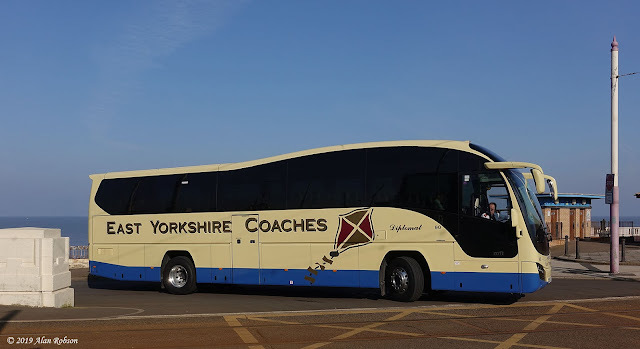 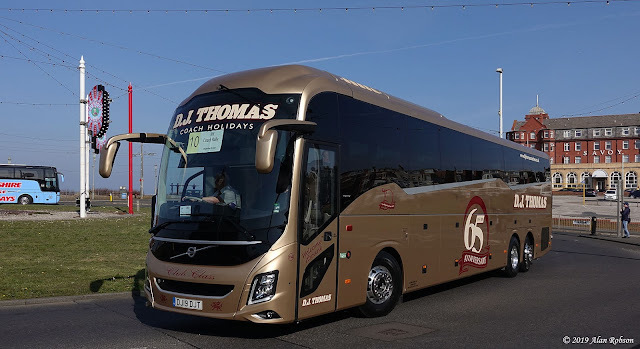 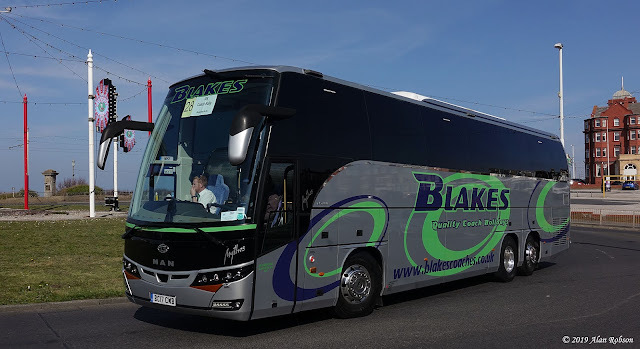 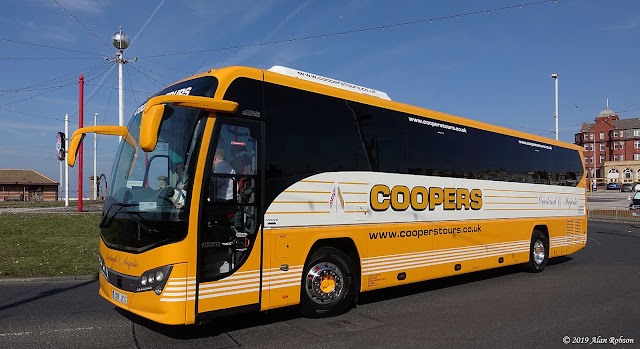 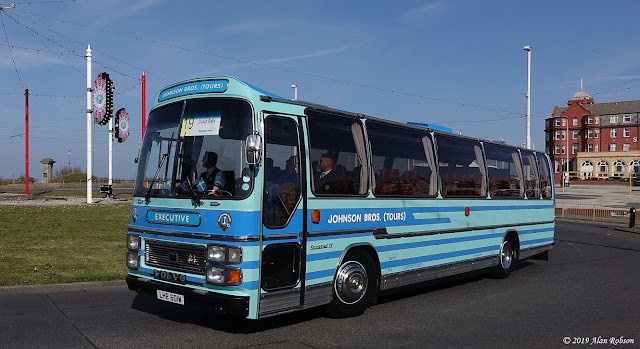 The 65th annual UK Coach Rally was held in Blackpool over the weekend of the 6th & 7th April. 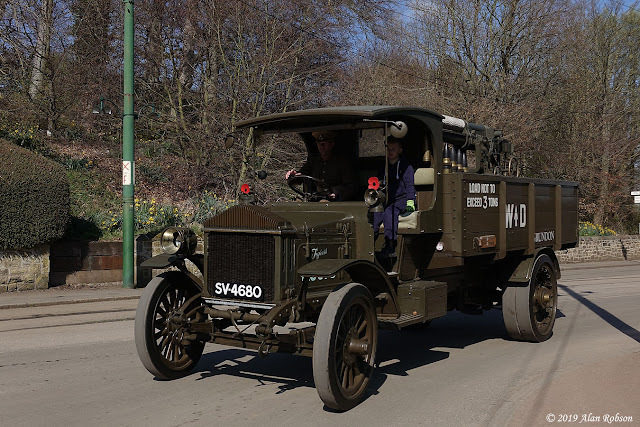 The 2019 rally began on the Saturday with a road run commencing from Middle Walk, the coaches arriving back there about two hours later. 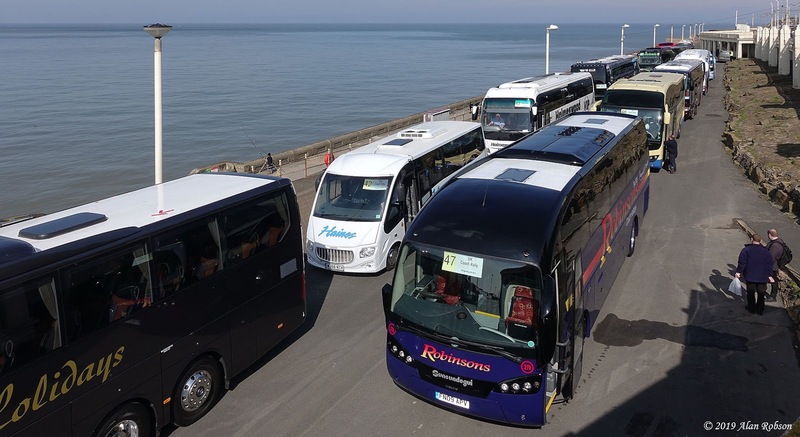 Following the road run a series of individual driving tests for each of the coach drivers took place on the lower promenade below the Metropole Hotel. 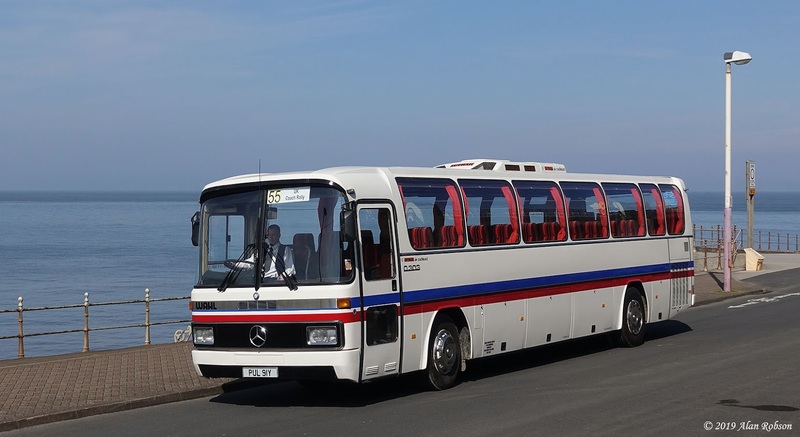 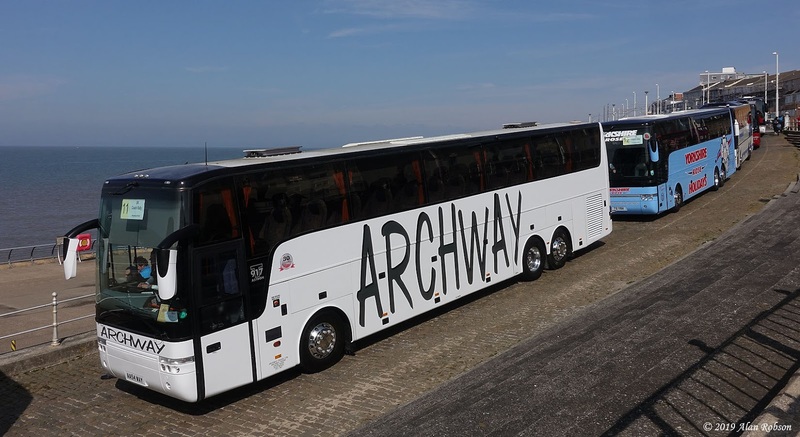 After each entrant had completed their driving test, they drove to the Tower Headland where they were lined up for display with the other coaches. 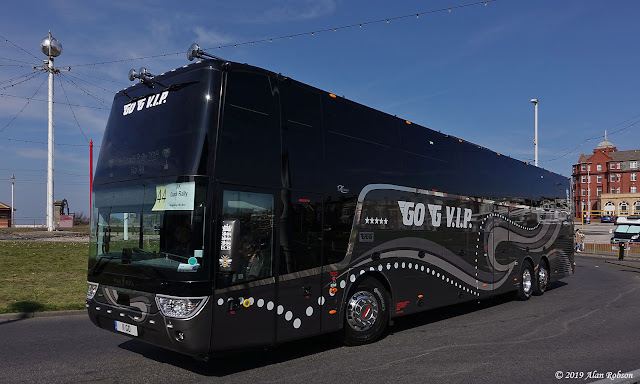 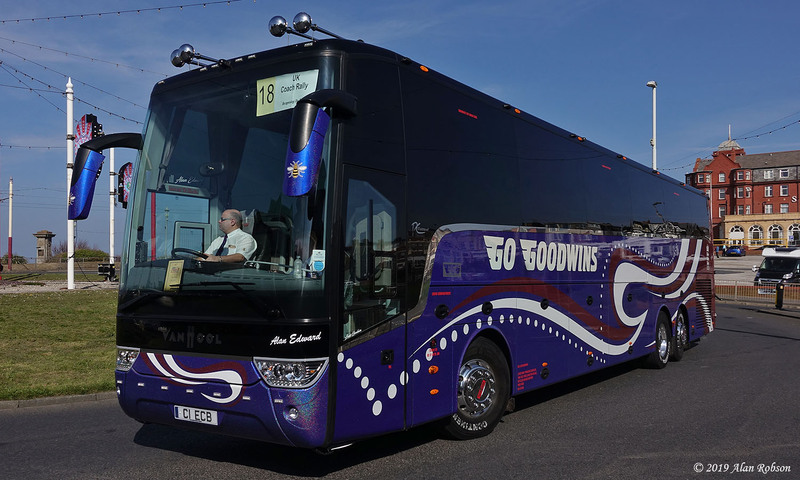 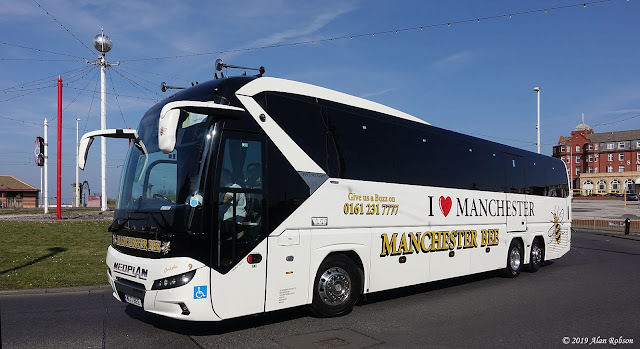 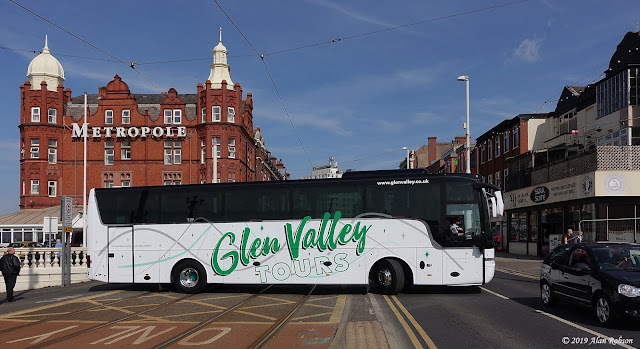 Go G VIP won the 2019 Coach of the Year award for their Van Hool TDX21 Altano. 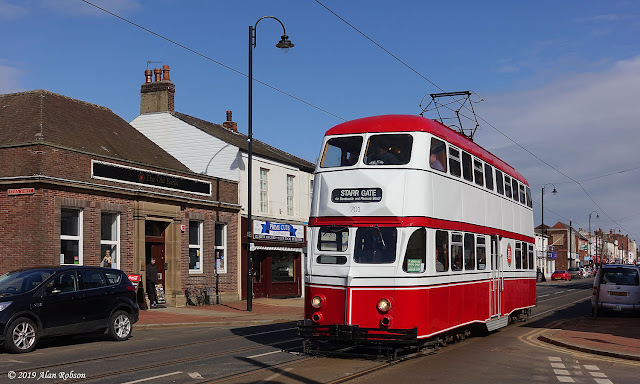 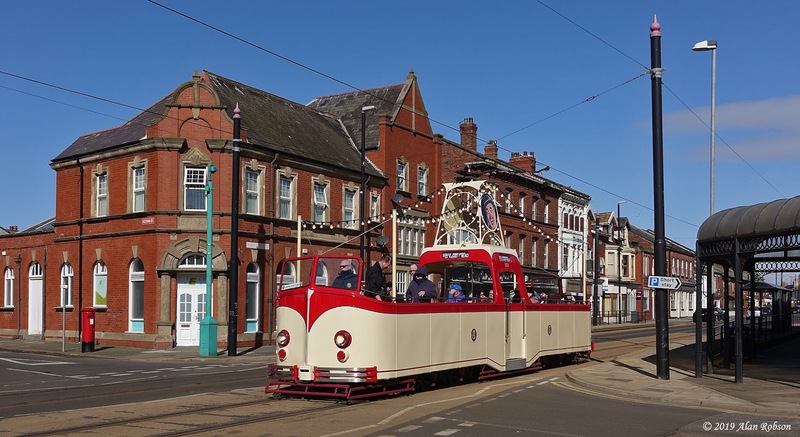 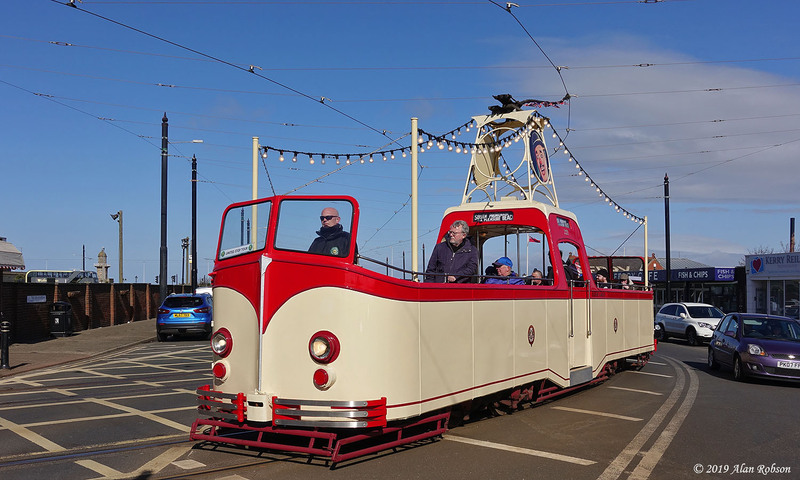 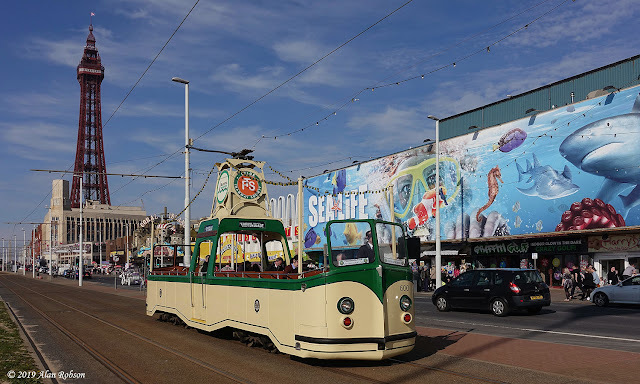 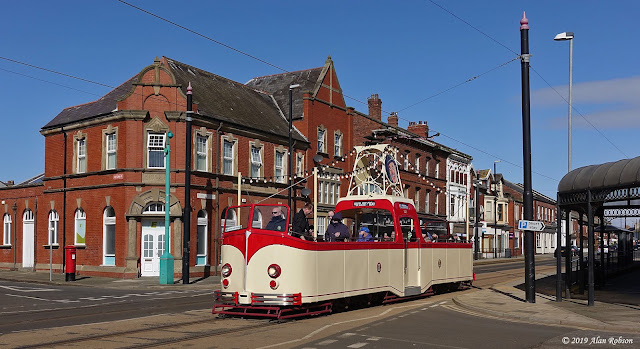 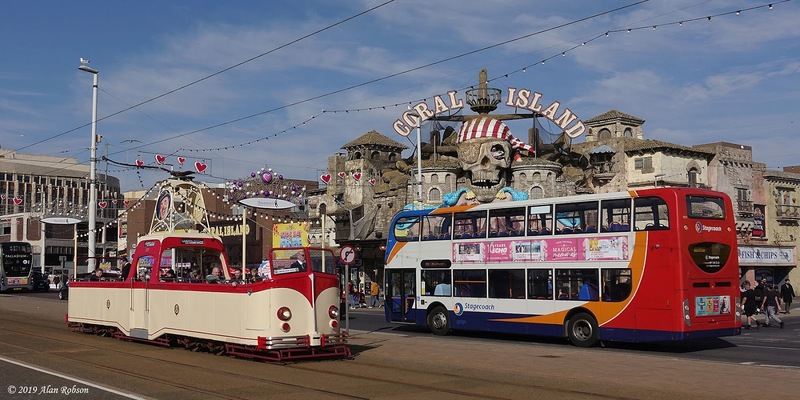 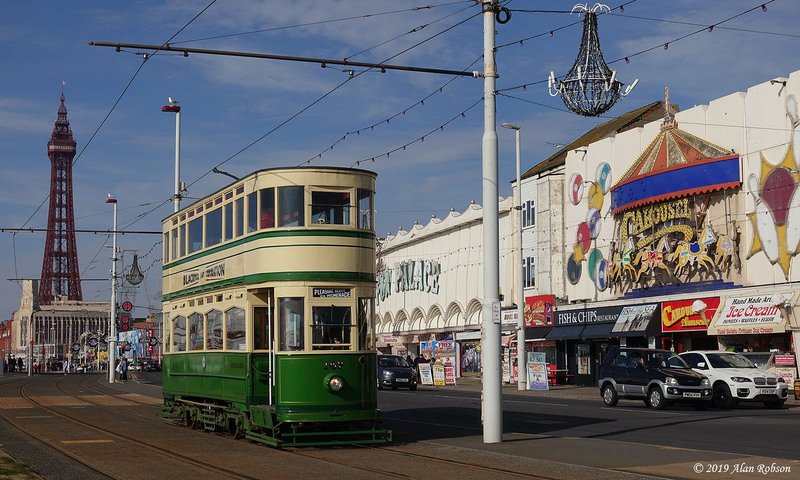 As Saturday 6th April was the first day of the annual UK Coach Rally in Blackpool, the Heritage Tram Tours ran twice the normal number of trams for the day. 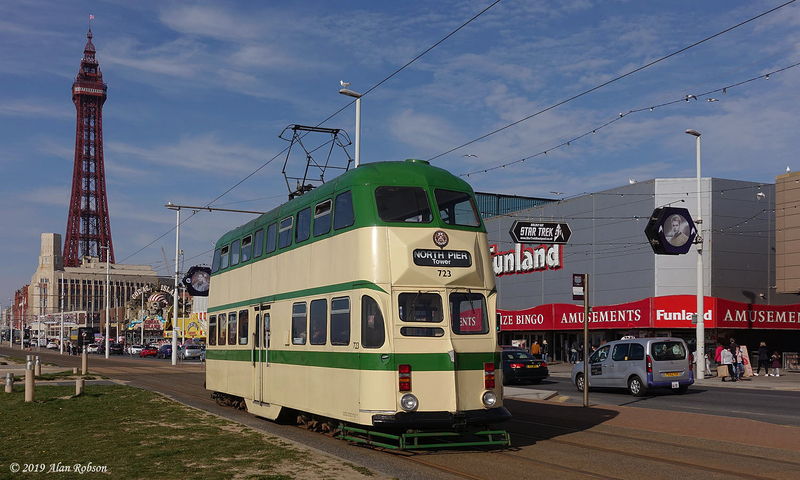 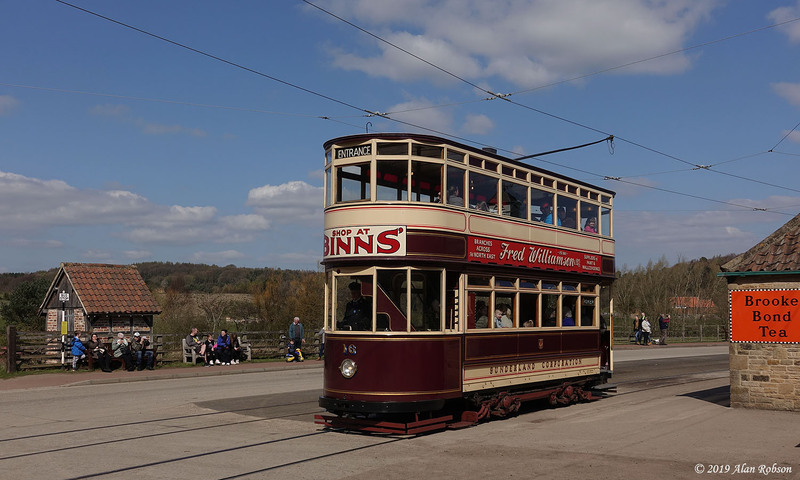 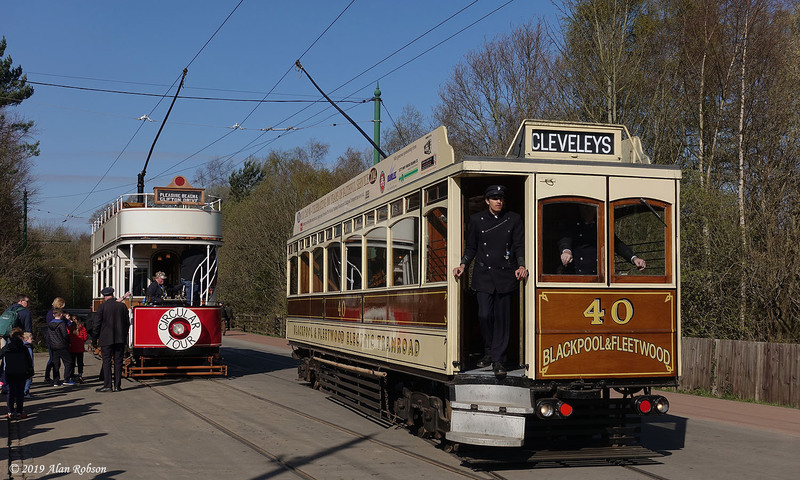 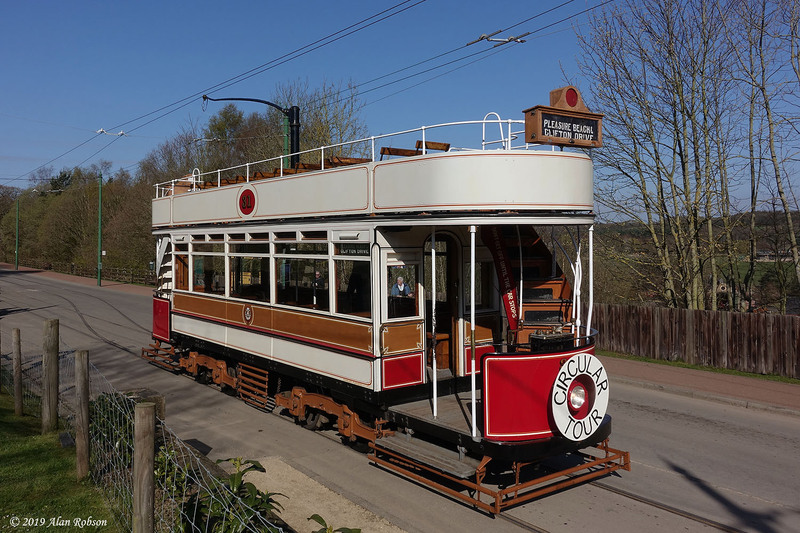 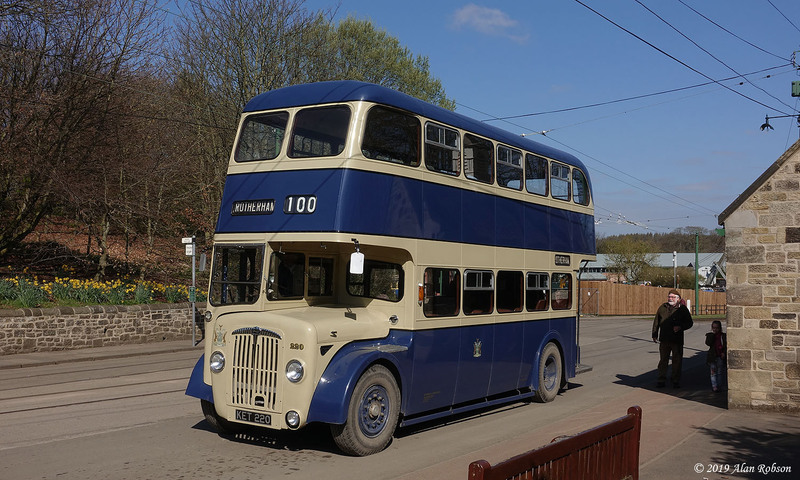 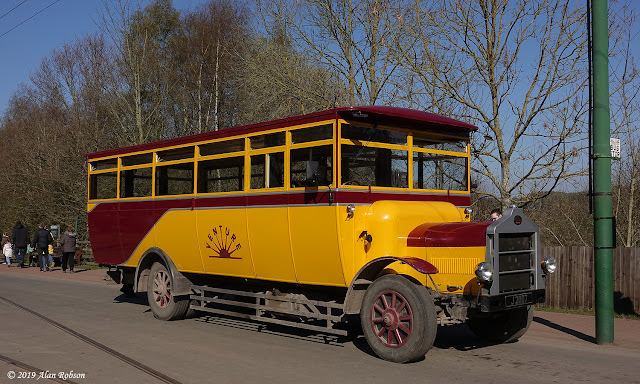 Instead of the usual two car weekend service, four heritage trams were in use throughout the day, with Standard 147 and Balloon 723 along with Boats 227 and 600 all operating the Promenade Tour service. 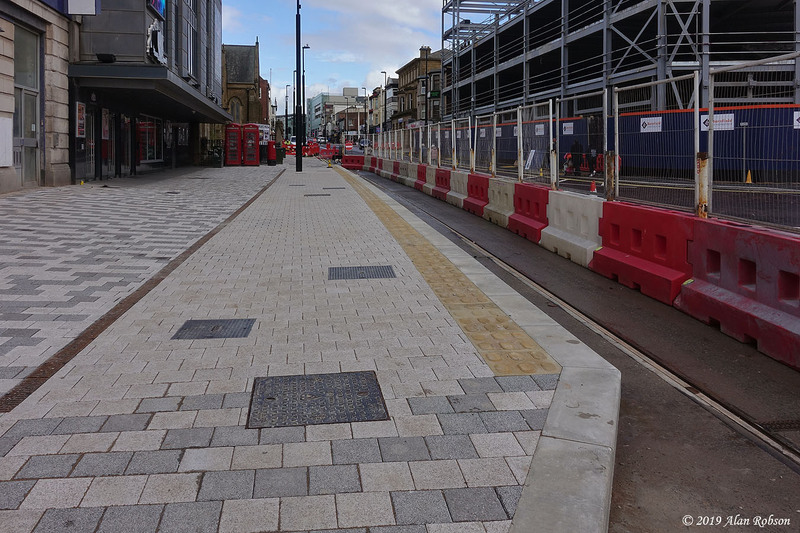 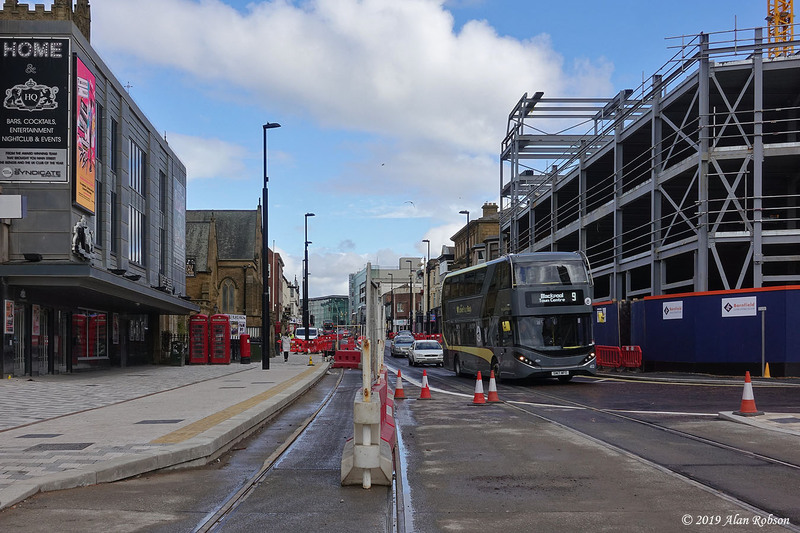 Paving work has now been completed on the platform for the eastbound tram stop in Talbot Square, which is part of the North Station tramway extension. 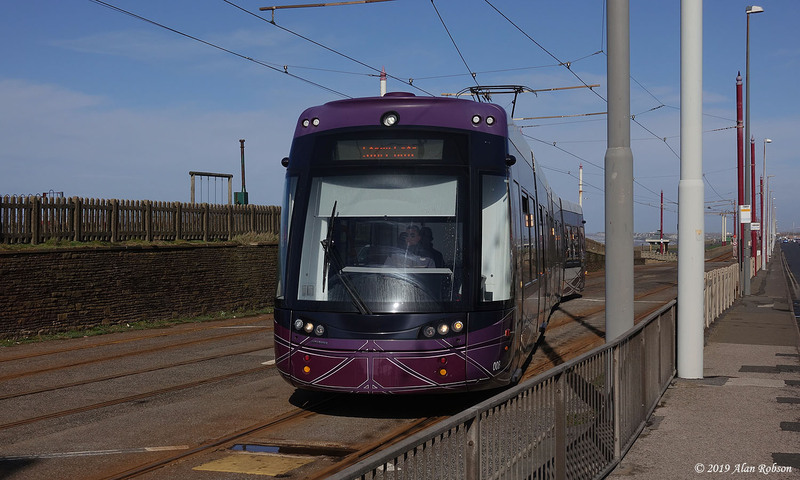 Presumably any additional work such as signs and seating, etc will be deferred until the new line is ready for opening in a few years time. A few shots from the heritage Winter Gold weekend that took place on the 23rd and 24th March. 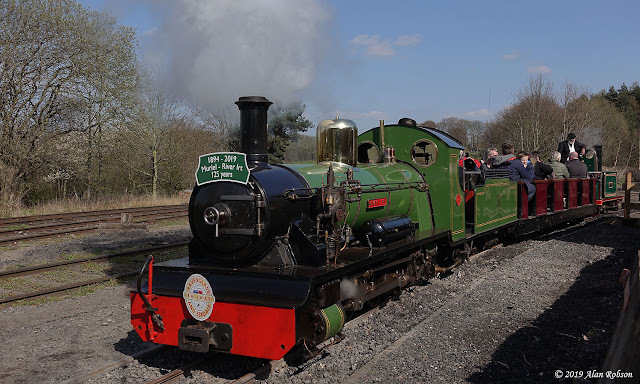 There was plenty of sunshine to be had in between the passing clouds, with the weekend seeing action from both of the currently serviceable Boats, 227 and 600. 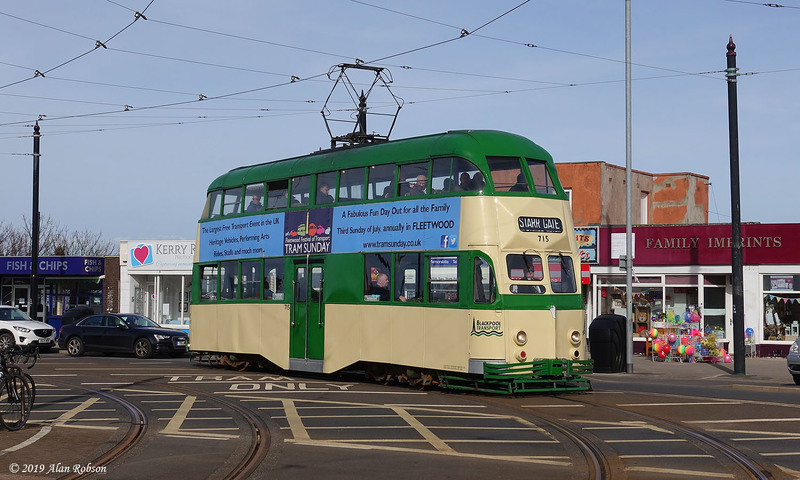 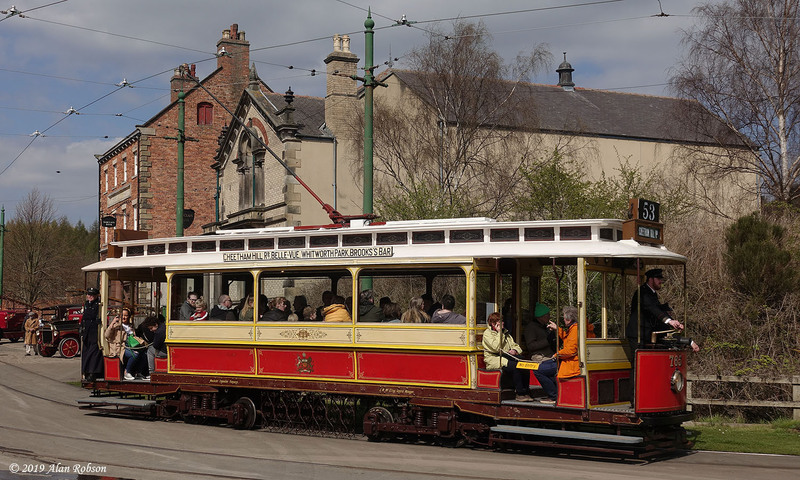 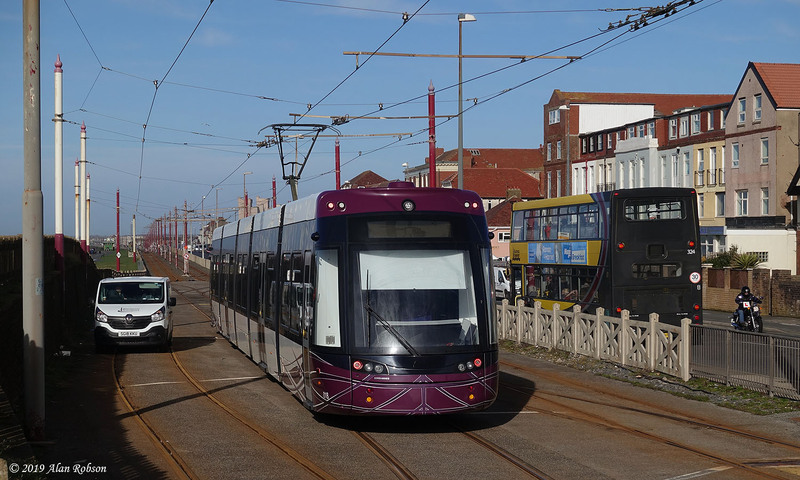 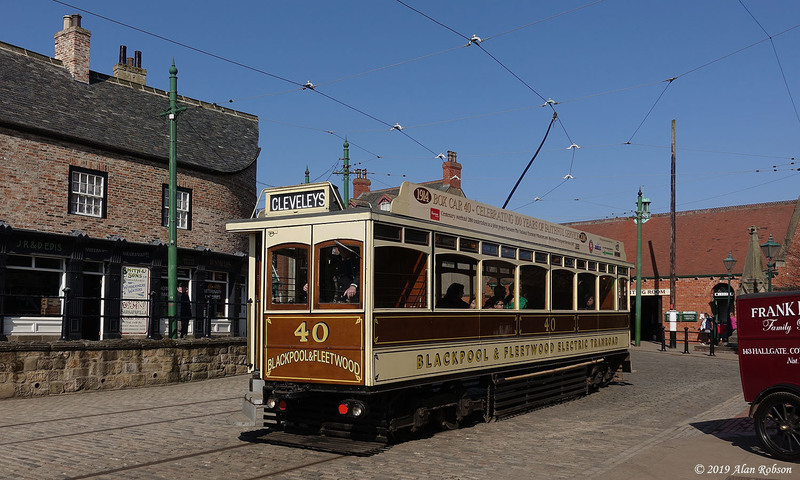 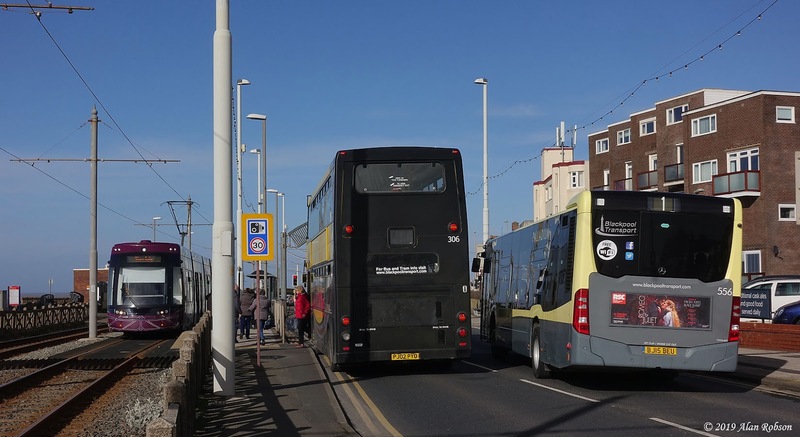 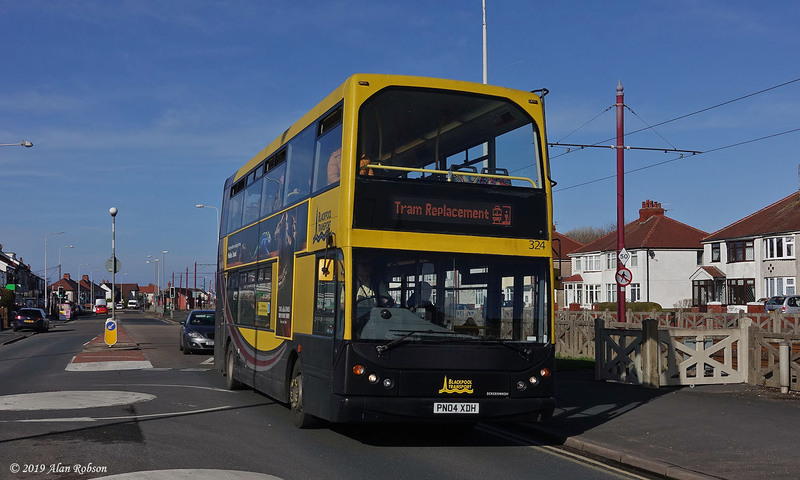 Between Monday 4th March and Thursday 7th March, Blackpool Transport were planning to operate a tram replacement bus service between Bispham and Fleetwood in both directions, due to essential welding work taking place on the track. 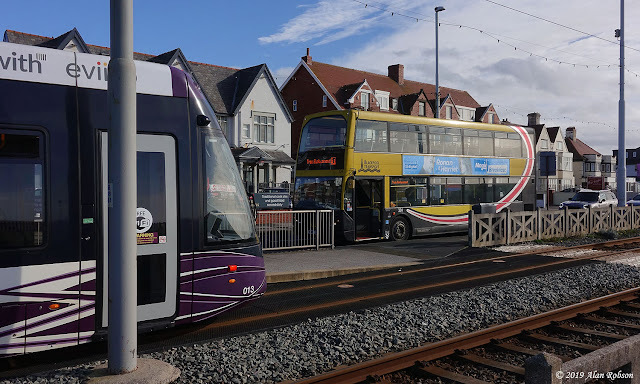 On Tuesday 5th March welding work was taking place at the loop at Little Bispham, although work was completed by mid afternoon allowing the through tram service to Fleetwood to recommence at 1445. Southbound tram replacement buses operated around a loop at Bispham, via Red Bank Road, Warbreck Drive, Cavendish Road, then north along Queen's Promenade to drop off passengers adjacent to the southbound tram platform at Bispham. 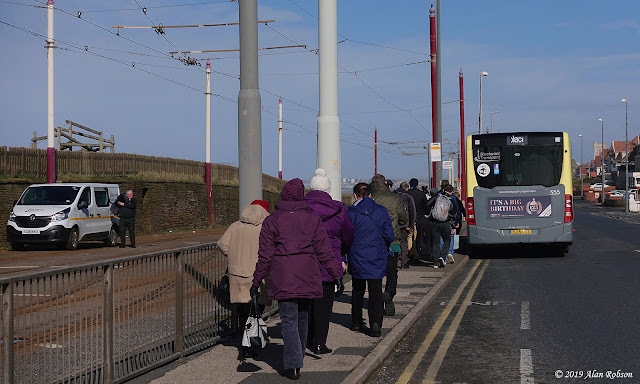 Northbound tram passengers alighting at Bispham caught the replacement bus at the regular bus stop just north of Red Bank Road traffic lights.